Aikatsu! – 91 | Mezashite! So something interesting about the way Mizuki refers to everyone. This is taken just from the recap scene. Here’s my take on it. Mizuki respects Otome as Starlight Queen and as a very skilled idol, but is keeping a little bit of distance. She refers to Sora and Seira with -chan, which is how she originally referred to Ichigo up until their joint concert way back in season 1. 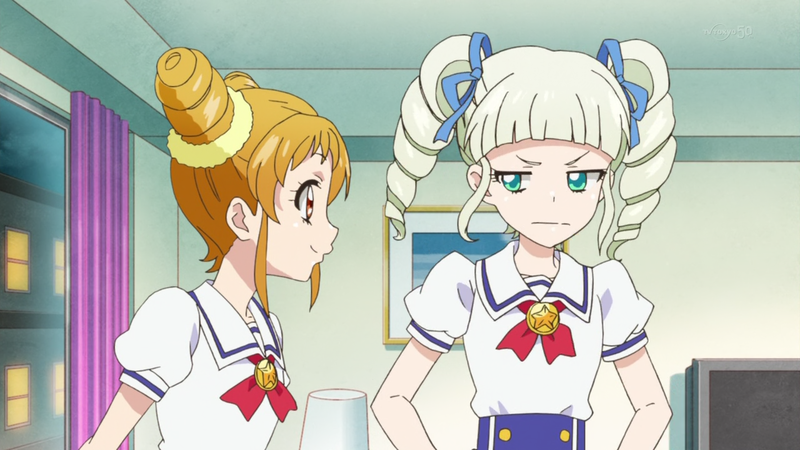 It’s not that she’s looking down at them, but more like she sees them as cute younger girls, but not rivals in Aikatsu. Finally, she calls Ichigo and Mikuru only by their first names. Let me note that Mizuki went Ichigo-chan -> Hoshimiya -> Ichigo over the series. The middle point here is similar to how I explained Otome; she [at least tries] to see her as an equal, but not one who she’s very close to. It shows respect but distance. But now, she’s on a simple first-name basis with her. This shows a very close form of respect. They’ve been through a lot together, competed and stood alongside each other, and have come very far. I don’t know how long it’s been, but this is a significant point in their development. It’s more complex than when we were discussing Ichigo a few days ago, and it shows just how much care goes into these characters. Or perhaps not. Maybe this sort of thing is natural to Japanese people, but it’s interesting from my perspective to break it down and analyze it. Are you guys going to do “Hello!! Kin-iro Mosaic” when the time comes? Unknown as of now. Also I’ll just say this here, to anyone asking about the Aikatsu movie, you’re aware it airs in 4 months, right? BDs won’t even be out for an additional 6 months after that. See you in a year. Since you brought it up…will you be subbing the movie when it comes out? Also, thanks for all the subs! ‘See you in a year’. The answer is pretty obvious here. Hmmm, time to learn Japanese then! I wish they stayed with the DCD ver elections that included Akari and Aoi instead of Maria and Seira… Akari is my fav idol in Aikatsu! I honestly thought she would have a bigger role in the second half of the season after her introduction. Yeah Akari is the protagonist. S3 info was posted today. I was seriously getting withdrawal symptoms there! Thankyou for the subs! Great episode and some really interesting comments on Mizuki/Ichigo. Hmmmm, I’m a little disappointed with some of the picks but I guess they wanted to have even numbers from Starlight and DreAca represented. I am glad Yurika was chosen – I love her singing voice. I also think it’s funny that they’d cover the beginning of the tour and then the it ends in the next episode, at least the Star Anis tour covered more than 2 episodes, didn’t it? I’d say your thoughts regarding Mizuki’s way of addressing everyone is spot on; if you hadn’t mentioned it I honestly wouldn’t have given it much thought, so thanks for pointing it out. As always thanks for your good work! Hmmm, I guess it just felt longer, oh well, not the first time I’ve been wrong and it certainly won’t be the last. Its been a while since we’ve seen akari : i wonder where she is and I keep hoping to see her in the next episode before watching the preview weekly and always get disappointed. That aside I am probably feeling like raichi tbh i really like aoi and its sad I wont see much of her next ep : but i am glad there is yurika and ichigo- they are probably my fav characters there, btw I heard there is an aikatsu movie right? Idk when it releases or whats it about but I am hoping you guys are subbing it. Are you subbing it?? nvm read the comment above. I’m just marathoning Aikatsu after giving it on-hold status for almost half a year and I must say that I put it there in a very unfortunate moment. Right before it once more started to be quite good. I’m in like 7/8 ok-ish with the results of Aikatsu8. I just don’t get what the hell is Maria doing there. It’s so plain character. There is no way she’s better than Aoi or Ran. I don’t like DreAce girls in general but the show somehow tries to justify Seira’s popularity and Sora alkso established herself as a designer. Maria on the other hand is… Why? Just why?